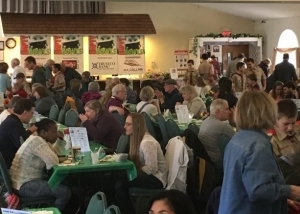 Sunday, April 10th, was a huge success for the Wilton Food Pantry’s annual fundraiser at the Wilton Elks Club. After setting a fundraising record last year, the Pantry exceeded that record by $3,000! This year Empty Bowls set a new net record of $20,000+. This money allows the Pantry to meet its operational expenses as well as purchase food (at a steep discount) from the Regional Food Bank. So far this year, Wilton residents using the Pantry are up sharply over the same period last year. Thank you to all the wonderful people who made this year’s event a huge success. Picture Gallery and more info here.